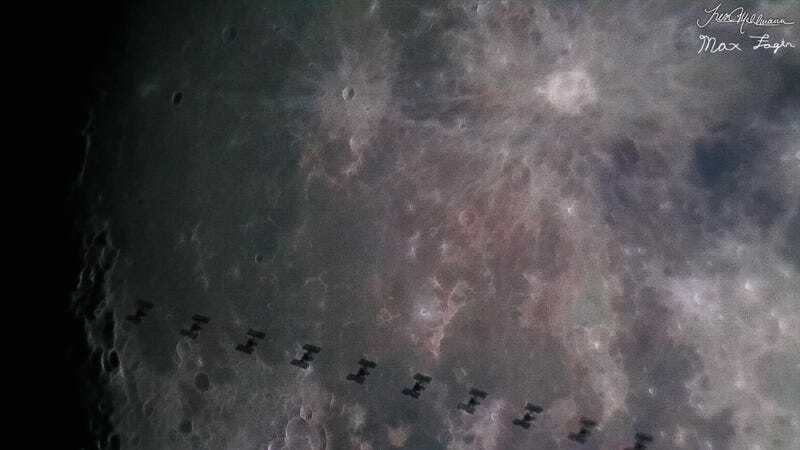 That was my first impression, at least, after checking out these incredible images of the ISS transiting a waxing gibbous moon on September 25th. The photos was captured Purdue undergrad Trevor Mahlmann and former graduate student Max Fagin, two self-identified aspiring astronauts. If taking money shots of the ISS counts toward NASA’s application process, I’d say they’re both shoo-ins. Everything about the shot was carefully planned. Mahlmann and Fagin figured out precisely when the ISS was set to cross in front of the Moon, and arrived at a previously scouted location (a cornfield in central Illinois) two hours early to get their telescopes set up and focused. A 14-inch telescope was outfitted with a Canon Rebel Camera set to video mode, while a six-inch scope paired with a Canon 7D Mark II set at a 10 frames-per-second capture rate. It was a lot of preparation, but the results were well worth it. Malhmann is proving himself quite the pro when it comes spying the space station from Earth. Last summer, he wowed us with a shot of the ISS whizzing across the sky like a shooting star—a shot that he captured from the window of a Southwest flight. Naturally, we can’t wait to see what he comes up with next. Correction 1/3: An earlier version of this article stated that both Mahlmann and Fagin are graduate students at Purdue. Image courtesy of Trevor Malhmann and reproduced with permission. Learn more about these photos on Malhmann’s website.